Gluten Free Blueberry Buckle tastes as good as grandma used to make but with a modern twist of being made without wheat flour. Warm, moist coffee cake supports a heavy load of blueberries, causing the center to “buckle” under the weight of juicy flavor. Topped with a crumbly streusel topping. I am told that when I was a baby, my favorite baby food was Blueberry Buckle. I was born two months premature, so my mom was all about offering me a variety of healthy options in order to put weight on my (then) willowy frame. If memory serves correctly, it was my great-grandmother that first gave me the dessert-style jarred wonder that was blueberry buckle baby food. Apparently, one bite and I was as eager as they’d ever seen me trying to eat every last drop as quickly as fast as they could spoon it into my mouth. As with many infants, I might have snubbed my nose at the pureed green beans, and very likely those wretched meat pastes that they still try to pass off as food for babies. I can’t really be sure about the latter, but I’m certain that Blueberry Buckle was my favorite as an infant because it’s a long time favorite of mine as an adult. Although, after growing four tiny humans in my body, I’m pretty sure that I wouldn’t be accused of being willowy at this point. This may have attributed to the problem, too. A tiny fact will not keep me from indulging in Blueberry Buckle when fresh blueberries are in season. After all, what is the point of living an active, healthy lifestyle if not to eat more dessert? Take note in the photographs how the edge of the cake rises higher than the middle of the cake. Blueberry Buckle gets it’s name because a combination of gravity and baking science causes the weight of the fresh blueberries to press the cake batter a down bit in the middle while it bakes from the outside in–thus, causing the cake to “buckle” under the weight of the fruit. For this and other food science-y reasons, using fresh fruit is recommended over frozen. Frozen fruit will create a fruit crater, and no one wants a weird crater in their coffee cake. Believe me, I know. 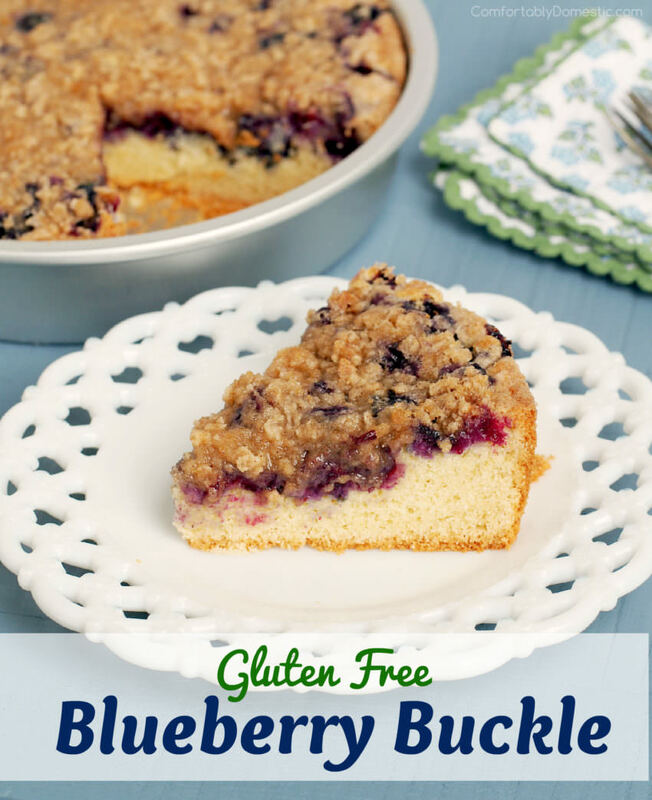 I developed this Gluten Free Blueberry Buckle recipe for a specific reason. In remembering the story of my infant days of being fed blueberry buckle with the hope of gaining weight, I was also reminded of my gluten free friends and their struggle to find tasty treats with the taste and texture of their wheat flour-based cousins. This ones for you, Friends! I have it on the authority of four ravenous sons and a Bacon Slayer that this recipe tastes just like the real deal. Warm, moist cake supports a heavy load of blueberries, causing the center to “buckle” under the weight of juicy flavor. 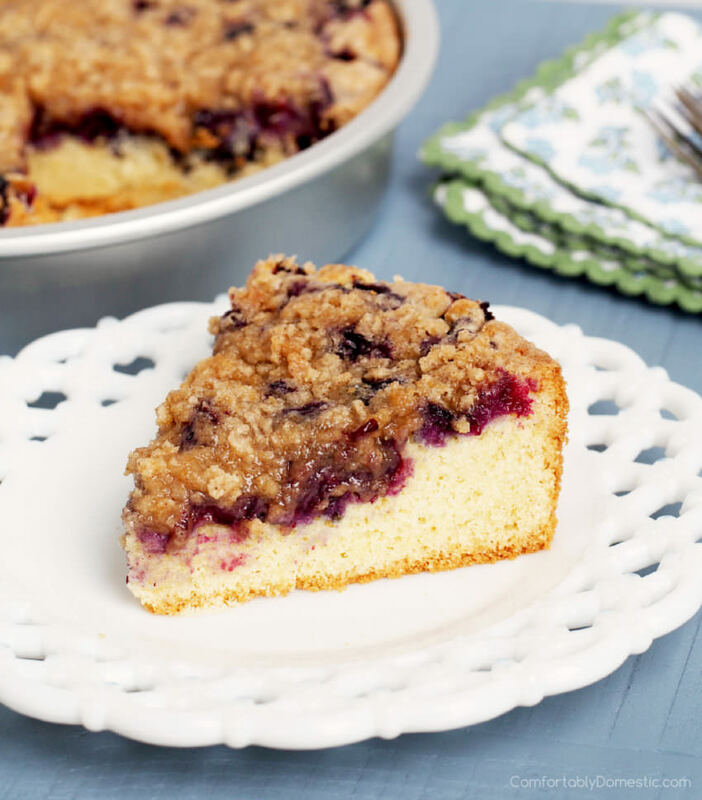 Topped with a crumbly streusel, Gluten Free Blueberry Buckle tastes as good as grandma used to make but with a modern twist of being made without wheat flour. Preheat the oven to 350 degrees F. Lightly grease a 9-inch round cake pan with softened butter or non-hydrogenated vegetable shortening; set the pan aside. Prepare the cake by whisking the gluten free all purpose flour mix together in a large bowl with the baking powder and salt. In a medium bowl, cream the softened butter with the sugar until fluffy. Beat in the eggs, one at a time, until fully incorporated. Gradually stir the milk into the other wet ingredients. Pour the wet mixture over the dry mixture, gently whisking until a smooth batter comes together. Spread the batter into the prepared pan. Sprinkle fresh blueberries over the batter, and then set aside while preparing the crumb topping. In a small bowl, whisk the gluten free all purpose flour mix together with the brown sugar, granulated sugar, and cinnamon. Toss the chilled butter cubes into the bowl. Work the butter into the topping mixture with a pastry cutter, or by rubbing between with clean fingertips, until the butter is the size of peas. Sprinkle the topping evenly over the blueberries. Bake at 350 degrees F for 50 to 60 minutes, or until a cake is just set and topping is crisp. Transfer cake to a wire rack to cool completely before serving. [u]Recipe Notes: This recipe was developed and extensively tested using King Arthur Flour All-Purpose Flour Mix. As gluten free flour mixes vary widely in both quality and ingredients, I can only guarantee results when using KAF brand. While most fruit buckles are perfectly lovely served warm, I recommend allowing the gluten free version to cool completely prior to serving because I find that the leftover cake dries out considerably when sliced warm. If leftovers are not a concern because none are anticipated, then by all means, serve the cake warm. Is this flour cup for cup? Yes! You can substitute standard all purpose flour cup for cup in place of the gluten free mix. I am not sure this recipe is right. The blueberry buckle I remember had 1/4 c shortnening ( I use butter) and 3/4 cup milk. There is no shortening in this recipe, and 1/4 cup milk does not seem like enough for the 2 cups baking mix. In my experience, the wetter batters result in a more acceptable product. That is why I like King Arthur's popver recipe with a 5 liquid to 1 multipurpose baking mix ratio. 1 to 8 sounds too dry for this cake. Baking ratios are very interesting to experiment with, Cheryl. I find that 4 Tbs. 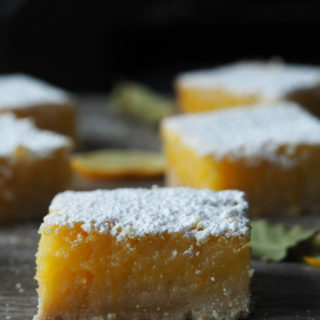 butter with 1/4 cup of milk in the batter works well for this recipe. A popover dough is much more wet in order to achieve the extreme airy rise, so the 5 to 1 ratio for popovers makes sense. Cake batter results in a denser product, so 1 to 8 works for this recipe. It sounds as though you came to your love of blueberry buckle early! And what a beautiful dessert to offer to anyone, gluten-free or not. I'll be passing this recipe on to a couple of my friends with Celiac. When my kids were babies, those wretched jars of baby food were all (it seemed) was available to young mothers. These days new moms are so much more savvy and smart about what they're feeding their kids. If I had it to do all over again, I'd be the one with the baby bullet and puree everything within sight...including your delicious gluten free blueberry buckle! Oh my gosh, I had completely forgotten about blueberry buckle baby food - I loved that stuff, too. 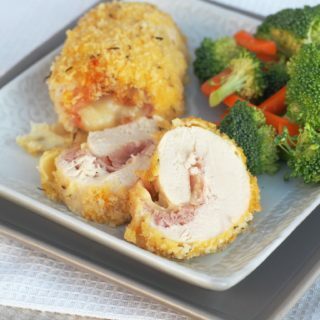 This looks fantastic, and I love that it's gluten-free so that I can make it for my mom (who can't have gluten). Can't wait to try it! Hooray! I love being able to bake for all of my loved ones, so I sure hope that your mama loves it.